Peak Oil Debunked: 27. WHERE DOES ALL THE OIL GO? The United States consumes roughly 20 million barrels per day (MMbpd) of crude oil. This is a phenomenal amount, and constitutes about 25% of the world's oil production. So where does it all go? The stats show that personal transport accounts for 45% of U.S. consumption -- about twice the consumption of trucking, aviation and shipping combined. 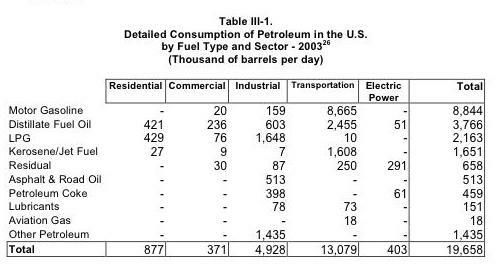 C. Petroleum in the Current U.S. Economy The 39 quad consumption of oil in the U.S. in 2003 is equivalent to 19.7 million barrels of oil per day (MM bpd), including almost 13.1 MM bpd consumed by the transportation sector and 4.9 MM bpd by the industrial sector, as shown in Table III-1. 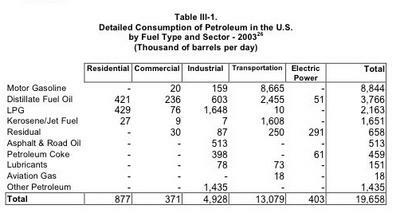 This table also shows the petroleum fuel types consumed by each sector. Motor gasoline consumption accounted for 45 percent of U.S. daily petroleum consumption, nearly 9 MM bpd, almost all of which was used in autos and light trucks. Distillate fuel oil was the second-most consumed oil product at almost 3.8 MM bpd (19 percent of consumption), and most was used as diesel fuel for medium and heavy trucks. Finally, the third most consumed oil product was liquefied petroleum gases, at 2.2 MM bpd equivalent (11 percent of total consumption), most of which was used in the industrial sector as feedstock by the chemicals industry. Only two other consuming areas exceeded the 1 MM bpd level: kerosene and jet fuel in the transportation sector, primarily for airplanes, and "other petroleum" by the industrial sector, primarily petroleum feedstocks used to produce non-fuel products in the petroleum and chemical industries. Peak oil is not a threat to the stability of civilization, world trade or global food supplies (or even the transport of food supplies). It is first and foremost a problem of massive fuel waste in private automobiles. Essentially, the entire production of Saudi Arabia is being burned everyday by Americans commuting to work and driving to the mall etc. Strictly speaking, none of that fuel consumption is necessary. It is a symptom of a wasteful, environmentally destructive car culture which needs to be brought under control. 1) People need alternatives to using their cars for commuting. Any PO "Matthattan Project" must include widespread establishment of light-rail and rapid transit buses, among other transport solutions. 2) CAFE standards must be increased and enforced. It should be done in increments every few years or so. In 15-20 years, the average MPG for the auto fleet in this country should 40 MPG. 3)Alternative fuels need to be phased in. Market forces are already giving rise to biodiesel and ethanol-based fuels. Tax-based incentives from government could help expedite this process. P.S. I was on PO.com yesterday and a sig caught my eye. It said "PO is not an energy crisis. It is a liquid fuels crisis." If we address the gasoline problem for our cars, we go a long way in helping to smooth out the transition from dependancy on oil. "Essentially, the entire production of Saudi Arabia is being burned everyday by Americans commuting to work and driving to the mall etc. Strictly speaking, none of that fuel consumption is necessary." Thats true, lets all quit working tomorrow and see what happens! People need to ditch their hummers, Esclades, and jacked up pickup trucks. Congress needs to tax gasoline users based on their fuel efficiency to discourage people from driving fuel inefficient vehicles (but that wouldn't happen! nobody would vote for that guy except for me).